Are you a parent of a child receiving special education services? Then this conference is for you! No registration fee! Two nights lodging and most meals furnished. Parents create guidelines, plan and run the PEP conference. PEP is unique in that it is a conference FOR parents BY parents. Sessions include: IFSP/IEP Process, Social Skills, Estate Planning, Positive Behavior Management, and more. This entry was posted in Uncategorized on February 22, 2017 by Jennifer Gepson. Congratulations to Avery McKennan, Elizabeth Pace and Aaron Johnson for their achievements at the Elkhorn Band Olympics last Saturday February 18th. They all received superior ratings and 3rd place overall. This entry was posted in Uncategorized on February 21, 2017 by Jennifer Gepson. ¡No te preocupes! Don’t worry! 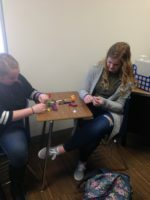 Spanish Club will help wish away your worries! ¡No te preocupes! Don’t worry! Spanish Club will help wish away your worries! 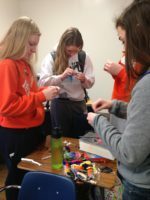 Friday, Spanish Club got together to make worry dolls. 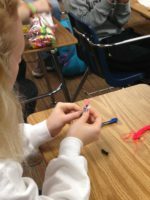 Worry dolls are small hand-made dolls that come from Guatemala and Mexico. There is a legend that if you have a problem or worry in life, you share it with the doll before going to bed. Tell one worry to each doll, place them beneath your pillow while you sleep and the dolls will take your worries away. This entry was posted in Uncategorized on February 3, 2017 by Jennifer Gepson.